For a long while now, household organisation has been a little thing which has been permanently playing on my mind. Running a house is hard enough on it’s own – let alone the fact we have two small tearaways – who in their time have both been nicknamed Tasmanian devils – running around too. Storage, de-cluttering and general tidying up are things I struggle with on a daily basis and solutions to my problems is something I’m therefore searching desperately for. But like many others out there I’m sure, I would like to do this stylishly too! Yes, I have the £1 wonder plastic storage containers which are piled high inside cupboards or under beds, but I’m running out places to hide them! So as a matter of urgency now I’ve been looking for something which will suit my home and add to the aesthetic of the house whilst serving a purpose too. One storage idea that consequently has caught my eye recently are storage baskets. These seem practical yet oh so beautiful and sophisticated at the same time. They are so versatile in that they can hold such a multitude of things too, from magazines to toys, from firewood to shoes and boots. They can be placed anywhere in the house, out on full view for all to see, yet they don’t look messy or out of place. They fit seamlessly into our everyday lifestyles. They don’t need lids to hide the ‘clutter’ as instead they make the ‘clutter’ a bit of an art piece in its own right! I’m rather loving the idea of strategically placed stylish mess! The beautifully woven accent pieces add an extra depth of natural warmth and fit the Autumnal season perfectly. 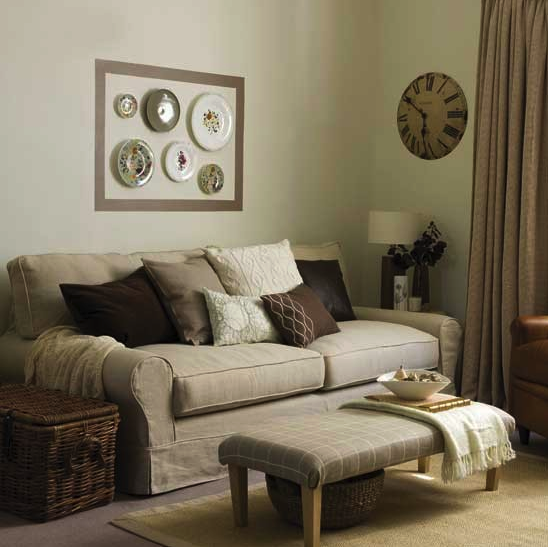 Why not pile your basket high with beautiful cable knit and cashmere throws to keep you all warm for the forthcoming winter months. 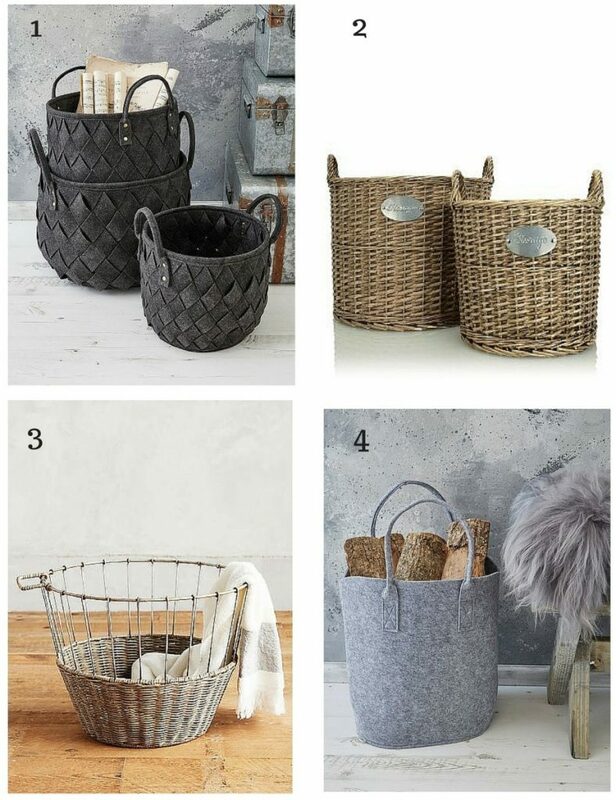 The rustic elements of the baskets fit effortlessly with this seasons scandi look too, but would equally add a hint of warmth and elegance against sharp monochrome backgrounds, or indeed add an extra pop of luxury against bold dramatic decors and plaid prints. Now. Where do I buy?? 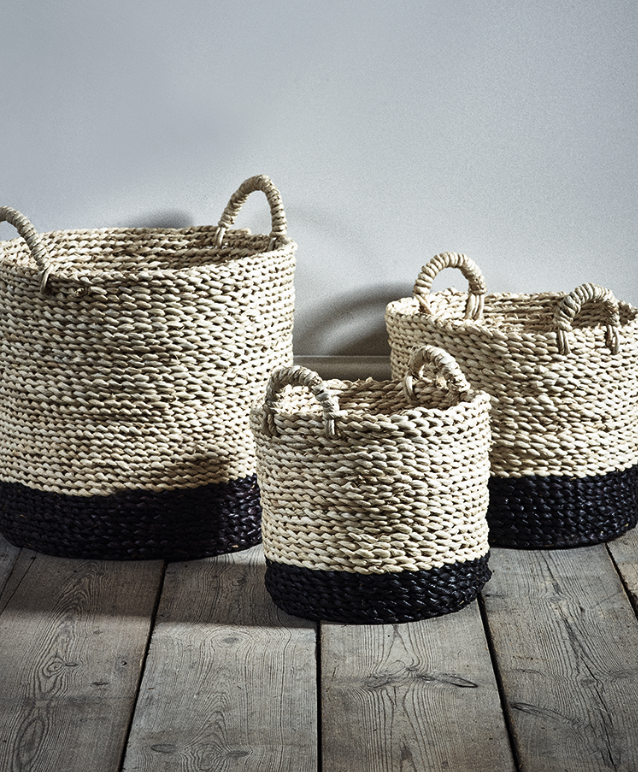 This basket makes a beautiful addition to this cream hallway with its natural tone and large chunky weave. This larger wicker basket is far more classic in style, and would be perfect for hiding anything with its lidded design. 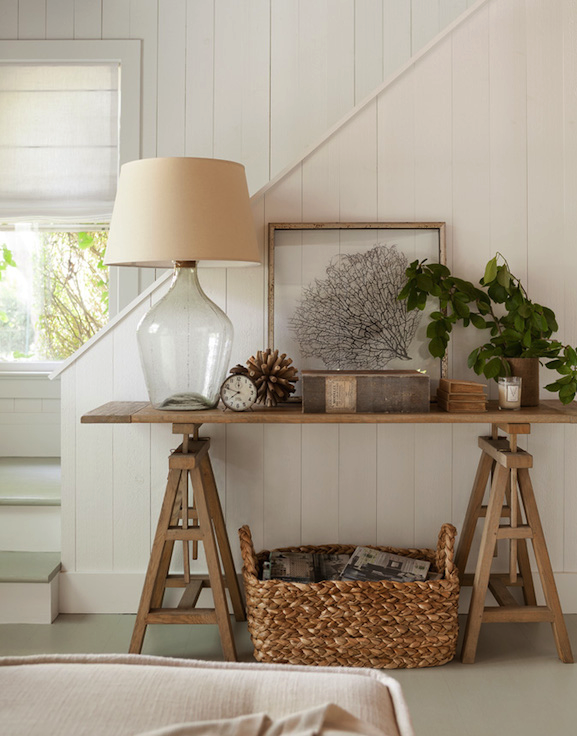 And the small round basket, although slightly hidden, still brings a beautiful natural element to the room. 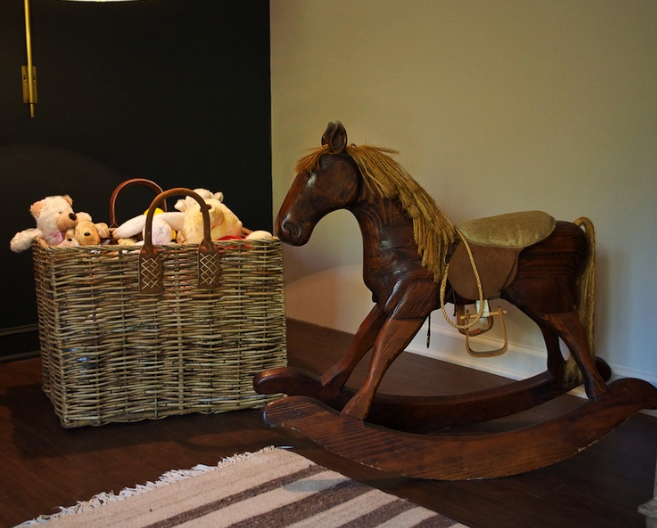 Here the basket is perfect for storing toys in a beautifully classic nursery, but as I mentioned above, the look is so versatile that it would suit a very modern and contemporary nursery décor too. These I think are exceptionally stunning. I love the easy fit non-standardised appearance, and I LOVE the dip dye bottoms. And here are a few others which have caught my eye..
Katy recently posted…Do You Sit Down Together At Mealtimes? Love your choices Steph. Those grey felt bag/baskets are very popular over here in Germany. I searched high and low for these recently and found the cheapest and best in Homebase. I couldn’t believe it. If you fancy the dip dye look, you could always section off an area and paint them (furniture paint works a treat and is not too expensive … Laura Ashley have fab colours). 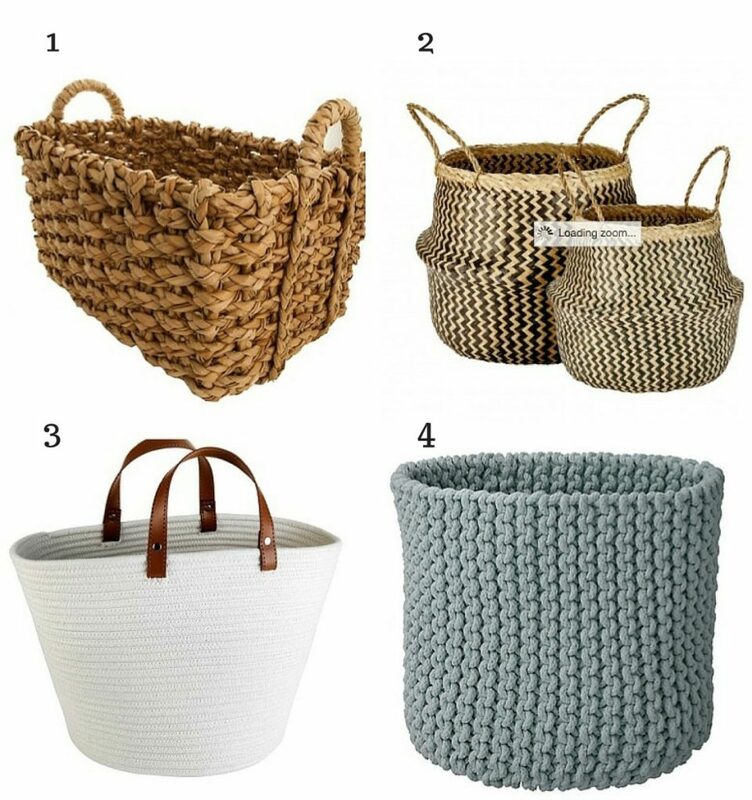 Storage baskets are really wonderful and stylish extra storage solution that can bring really warm and lovely atmosphere to the home interior. I love how many different kinds of baskets there are. There is the right one for every house! I lack storage space at home, so I will be really glad to have few baskets that I can use for magazine storage, toy storage or drawing supplies storage. Really great idea! Thanks for sharing!